Posted by Nick Verreos Labels: 2012 Grammy Awards, 2012 Grammy Awards Red Carpet, Grammys Red Carpet Misses, High-Low Dresses, Mullet Dresses, Robyn, Who Wore What? Mullet Robyn: Let's begin from head to toe--She's got TONGS on her ear, a white drop-shoulder oversized t-shirt that looks like she got from the Kmart Men's section, a not-so-flattering "high-low" skirt that is too tight (see the rippling and pulling across her thigh/abdomen) and then she finishes it all off with... 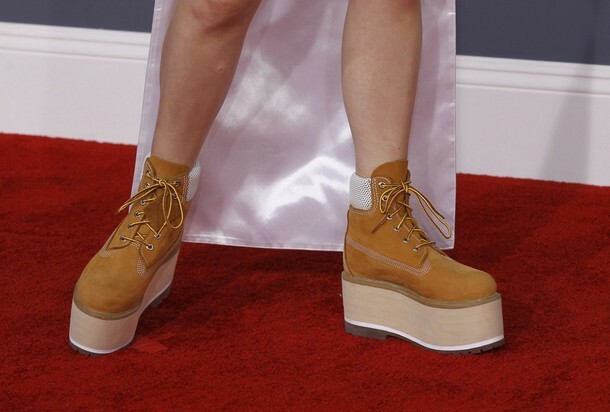 These Platform Construction Boots from a "Club Kid's Closet circa 1996". Oh Miss Robyn, WHYYYY?????? Dear Blog Readers, please ESPLAINNNNN and leave your comments below!!! 5 Responses to "WHO WORE WHAT?.....2012 Grammy Awards: Robyn"
Robyn is a knockout. Weep fashionistas. Don't f. Tell her what to do!! Robyn is a knockout. Weep fashionistas! Don't f....tell her what to do! !